Never tiring of Dominique Ansel's creations, it was now my turn to try his newest confection called the Waffogato. Hearing about this delicacy from my daily intake of DA news through my various foodie social outlets, I found out that the Waffogato is essentially another ingenious hybrid food. Paying a visit to DA right before my Portland trip, I was hopeful but skeptical I'd score one of these babies. My doubt was sadly validated, as I soon discovered that that Waffogato went as fast as that morning's Cronut. I kept the hope alive and went back a few weeks later with my co-workers only to find the Waffogato in stock - yay! I ordered one right away and watched them assemble it with admiration. Waffogato - What is an actual Waffogato, you may be wondering? Just like some of DA's other hybrid foods, it also consists of a bevy of different ingredients that you wouldn't normally think to put together, but that work really well. Melding together ice cream, tapioca balls and bits of Belgian waffle, the Waffogato brings together something nostalgic and luxurious at the same time. Served chilled, it's something you must eat pretty quickly, as the ice cream melts fast, especially since it's soaked in a sweet maple espresso liquid. I let it melt a little, walking back to work, but I loved the effect, as the liquid took on a milkshake-like consistency. The tapioca balls were distinctive and added surprising texture to each vanilla-ey bite. As much as I couldn't get enough, I impatiently await his next creation. Getting to the bakery after lunch, we were confronted by a long line and waited for about 15 minutes to be helped. And while the line went slowly, the end result was so delicious that as usual, it was totally worth it. 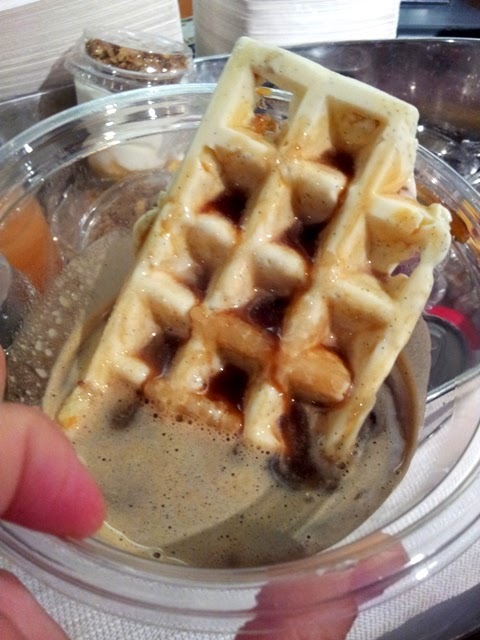 At $7 a pop, each Waffogato doesn't come cheap, but just like Dominique's other delicacies, you're paying for the magic. And as usual, it totally delivers.